Anderson is a composer very much ‘in the world’: highly regarded as a teacher, active as consultant and programmer, much called upon as a presenter, introducer, commentator and explicator of the music of his contemporaries. But composition, as an activity of the imagination, must be what begins for any composer when he seeks a space for individual creative thought away from the demands of the everyday. And certainly, the jewel-like beauty of a work such as Eden seems the achievement of a composer able to step back from the bustle of the world into such a space. This is not to say that successful composition might not keep an eye on the world: step back, yes, but only in order to see better, or to see more. There is a lot of world in this music, but it is not – or not only – the world suggested by Anderson’s professional affiliations. Two titles here refer to Eden, which for Anderson is less an emblem of escape or retreat than a ‘first nature’, a state of grace before which the music stands in homage. 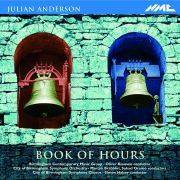 Like Bartók and like Messiaen, Anderson finds in the world a source of potential models and diverse causes for celebration: the songs of the birds, the folk music traditions of Eastern Europe and elsewhere, the bells and other sounds of worship and communal ritual which persist here and there in a world closer to home. His Eden is not a place from which man has been banished so much as an attitude which we might hope to recover, a light in which we might view our own world as if for the first time. It is a way of keeping in touch with the possibilities Anderson values most in contemporary music without divorcing it in its very contemporaneity from his other sources of inspiration – medieval art and music, for example, or the poetry of Emily Dickinson and of the nineteenth-century American hymn texts in which Anderson detects pre-echoes of her intimate, charmed language. Two of Anderson’s chief means of melodic elaboration – heterophony, in which several ‘voices’ (or instrumental parts) simultaneously sing variants of the same melody, and hocket, in which the notes of a single melody are distributed between two or more such parts – take their cue from folk music, and both are images of music as sharing. At the same time, of course, they represent a technical solution to the issue, pressing for the contemporary Western composer, of how musical lines might behave in post-tonal music. Harmonically, too, the instrumental pieces on this disc extend the Western tradition in ways that link them with the music of other cultures as well as with, say, the innovations of Gérard Grisey and Tristan Murail – innovations inspired in their turn by research into the science of acoustics and the psychology of perception. Like heterophony’s joyous babble of at-root-related voices, Anderson’s employment of non-tempered pitches (notes outside the tuning system used almost exclusively in Western music for 200 years) is designed to create not dissonance but extended consonance, building audible complexity from simple elements. Anderson’s harmonic practice is systematic, but ‘drawn from life’. As eclectic in inspiration as it is polished in execution, his music looks hard at the world and then, rather than imitating it exactly, ‘re-presents’ it through an act of imaginative sympathy. And if its representational conventions help it to paint a picture of the world outside, they are also responsible for its striking consistency of voice: from world it creates its own world, and embraces natural abundance as a condition for human engagement.